Paying tribute to Sgt. John White Swann at Glenarm. Tribute has been paid at Glenarm New Cemetery to a Larne footballer who died on active service during World War Two. The act of remembrance took place at the graveside of Sergeant (Wireless Op./Air Gunner) John White Swann of 107 Squadron R.A.F. Volunteer Reserve to mark the 75th anniversary of his death. A press cutting of Johnny Swann in his playing days. 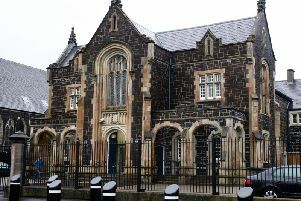 The service was conducted by Keith Parke and organised by Apprentice Boys of Derry Baker Club Larne Branch of which Sergeant Swann had been a founding member in February 1935, as had his father and brother. Wreaths were laid by the Swann family, the organising Apprentice Boys Club, Boyne Defenders LOL 1297 (of which he had also been a member), Ballymena Utd FC, Inver Red & Whites and Larne & District Great War Society. Born on April 7, 1913, Johnny Swann was the eldest son of Andrew and Jeannie of Old Glenarm Road and had two brothers and three sisters. He later worked in a weaving factory while playing junior football for Carrickfergus and Larne Harriers, winning the Larne Junior League with the latter in 1933. That year, he joined Larne and, after spending most of his first season in the Olympic and scoring three hat-tricks, he became a first team regular in 1934/35, and was in the side that took Glentoran to three matches in that season’s Irish Cup final before losing. In February 1936, having scored 18 times in 108 appearances for Larne’s two sides, he moved to Partick Thistle. In a three-year spell in Glasgow, he did well enough to attract the attention of some English clubs, but when he eventually moved, it was to Ballymena Utd in July 1939. He finally won an Irish Cup winner’s medal with them in 1940 when they beat Glenavon 2-0 in the final. Returning home to play for Larne the following season, he was a regular in the team between October 1940 and March 1941, when he enlisted. On July 2, 1941, he married Rosetta Brown McAuley in Glenarm Presbyterian Church and the couple lived in Castle Street in Glenarm. He was serving in England as a member of a bomber crew when he died on active service due to war operations, at Cambridge Hospital in Aldershot on September 15, 1943. He was interred in Glenarm New Cemetery.